Discrete GPS Trackers are incredibly useful - here you'll learn various ways in which our discrete GPS Trackers are used. Discrete GPS Trackers are commonly used as dementia trackers or elderly trackers - small, waterproof and tamperproof and discrete devices for tracking loved ones. Discrete GPS Trackers aren't going to beep, flash and or vibrate every time you need to locate it. With dementia trackers, the person might not understand the need or importance for carrying discrete GPS trackers. Something new and out-of-routine might be a cause for concern, and be liable to be left behind. This might sound ethically dubious, because a person should always be aware if you're tracking their location at all times. It seems an infringement of freedom. However, for relatives caring for a parent with dementia or Alzheimer's, or any vulnerable person liable to wander, its a case of being able to find them quickly or regularly involve local police in the search. Sometimes these situations can be incredibly dangerous, so the ability to locate is only really a safety measure - not a restriction. 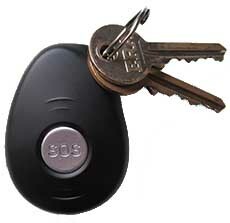 Discrete GPS Trackers are useful as they can be explained as a key-finder or <a href="https://www.personalgpstrackers.co.uk/sos-button" title="sos button">SOS button</a>. Again this might sound unethical, but if for example you have company cars, or lend your car to a friend or family member, you want to keep tabs on where the vehicle has been, when, and how fast - but without the driver necessarily knowing. Discrete GPS Trackers can be easily hidden, or even fixed to the underside of the car using a powerful <a href="https://www.personalgpstrackers.co.uk/magnetic-vehicle-tracking-devices">magnetic GPS Car Tracker</a>. If a child with a GPS tracker for children is vulnerable to kidnap, or a car, caravan, bike or lawnmower is liable to be stolen, discrete GPS trackers are less likely to be found because they're fairly small. Then, even if they are, its not obvious what they are or what they do. The SIM is hidden inside. Fortunately, our Stray Star GPS Dementia Tracker is one of the best discrete GPS Trackers on the market - and has a great number of features for anyone needing a discrete GPS Tracker. Click on any heading for more details. The SIM card can't be found and easily removed, unlike most mobile phones for example. Its not at all obvious it even has a SIM card - its installed inside the device which would need to be dismantled to get to it. Its possible if you know how, but the screws aren't even visible. Most discrete GPS Trackers can be accidentally switched off by clumsy hands or button pressing. Our Stray Star Discrete GPS Tracker has a hidden trick to being switched off, which isn't easy to do unless you know how! Send a simple text message, and the LEDs on the discrete GPS Tracker can be switched off, without affecting the functionality of the device at all. If someone sees or finds the GPS Tracker - it will look like its switched off, despite functioning perfectly normally! If you text our discrete GPS Trackers for a map location, they will immediately text you back without making a sound. The LEDs don't flash to indicate texting either - and you can switch them off (via text) too if you like. When you call our discrete GPS Trackers either for a two-way call or to simply listen to the surroundings, they will answer automatically. You can choose whether it first gives an audible tone, or a very brief vibration. If you have any concern about the wearers whereabouts, you can call the discrete GPS Tracker to listen in to the surroundings. The device will answer automatically, giving only a brief vibration when doing so. 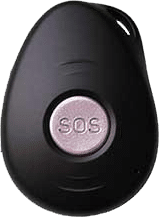 The only letters on the discrete GPS Tracker are "SOS" on the panic button on the front. If found, its unlikely that the finder will realise its a GPS tracking device - it looks like its just a panic button. Being very small and light, discrete GPS Trackers can be easily hidden in jackets, handbags, backpacks or vehicles. We have an optional velcro GPS Tracker pouch available which makes it even easier to fasten to things. So... if you're looking for discrete GPS Trackers, look no further. How typically might discrete GPS Trackers be used? Our customer Susan was interested in discrete GPS Trackers to help keep an eye on her father. He has dementia, lives in a care home and is prone to wandering. Something clunky and obvious would be distracting, and he tends to fiddle with buttons and pull things away that are attached. So because of this, Susan opted for our Stray Star GPS dementia tracker, one of the best and most loved discrete GPS Trackers on the market. The device is small enough for her to fasten in his shirt pocket. With a dementia tracker, getting the support of care homes is important, and they were willing to ensure it was inside his shirt pocket each morning. Now, Susan receives a text alert each time he goes wandering, and is able to receive regular location updates whenever she needs them via text. This is just one example of how discrete GPS Trackers might be used - your situation will be completely unique to you.